I’m always interested to learn more about countries with an interest in Central Asian higher education and it’s especially nice to hear about connections being made outside of the “usual” suspects (e.g. UK, USA, Canada, Germany, Switzerland). Here is a republication of a story from the University of Tsukuba in Japan about a Kazakhstan-Japan Students Forum held at the end of October. I’d love to hear from any Japan specialists who can tell me more about Japanese interest in Central Asia. 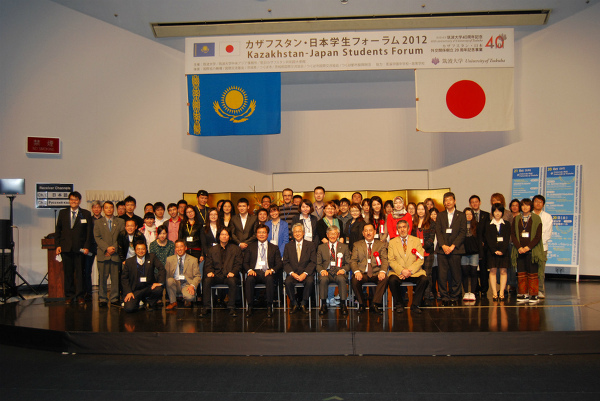 Kazakhstan-Japan Students Forum 2012 was held at the University of Tsukuba on October 20 and 21. It was held under the auspices of International Center for Central Asian Research and Education‚ the University of Tsukuba‚ and the Embassy of the Republic of Kazakhstan in Japan. The forum included keynote lectures by former ambassador of Japan to the Republic of Kazakhstan‚ minister-counselor of the Embassy of the Republic of Kazakhstan‚ and associate professor of Wako University. In addition‚ academic presentations by students from Kazakhstan‚ and presentations on Central Asian studies by students of the University of Tsukuba were held to promote better understanding of the two countries. The forum started with an opening remark by Vice President Michiyoshi Ae of the University of Tsukuba. He said that having transnational ideas is important to resolve the vast numbers of problems in the world‚ and expressed his expectation that Kazakhstan and Japanese students will deepen exchanges through the forum and cooperate on addressing global issues in the future. Vice President RAMAZANOV Telekkabul and staff of Kazakhstan National University were invited to the forum as guests. An opening ceremony‚ keynote lectures‚ and a reception party were held on 20th; section meeting‚ presentation on experiences of studying in Kazakhstan‚ special lectures‚ and closing ceremony were held on 21st. The forum attracted more than 120 people. Vice President Kazuhiko Shimizu and Mr. KURMANSEIT Batyrkhan (Minister-Counsellor of the Embassy of the Republic of Kazakhstan in Japan) conferred completion certificates of the forum to the students who made research presentations. The forum ended with the closing remarks of Vice President Shimizu‚ expressed his expectation for the students’ future activities. This entry was posted in Kazakhstan, Uncategorized and tagged Higher education, japan, Kazakhstan, student forum, tsukuba university.